Throughout Pokémon Crystal, there's a rule: sprites go on top of tiles. But there are exceptions: grass tiles overlap you as you walk, and the popup signs with location names appear above all the NPCs. But the grass tiles depend on using collision IDs $18 or $14, and the popup signs have their own special code. Is it possible to have a simple system for making any tile appear above sprites? Every tile on the screen has an attribute byte. The lowest three bits define the color, which is why there's only room for eight colors (from PAL_BG_GRAY, 0, to PAL_BG_TEXT, 7). The other bits control other properties. In particular, the high bit controls tile priority. So if the tilesets/*_palette_map.asm files could define tile priority as well as color, you could make any tile have priority over sprites. 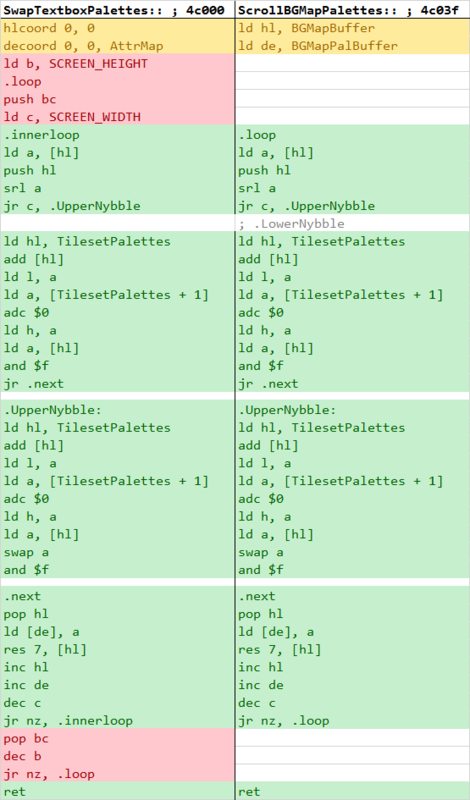 There's one problem: the tilepal macro packs two tile color definitions into each byte, using four bits per tile: three for the color (OAM_PALETTE), one for the bank (OAM_TILE_BANK). So we need to add space for more data. Now the tileset palette data will take up twice as much space—one byte per tile instead of half a byte—but you'll be able to use, for example, PRIORITY_GRAY instead of GRAY to define an overhead tile. Step 3: Edit main.asm's SwapTextboxPalettes and ScrollBGMapPalettes. These two routines read the tileset palette data, so they have to be updated to understand the new one-byte-per-tile format. While we're at it, we can also factor out a large chunk of identical code from both of them into its own subroutine. Anyway—at this point you are done! Now when you edit a palette_map.asm file, you can use the names PRIORITY_GRAY, PRIORITY_BROWN, etc instead of just GRAY, BROWN, etc, and the tile will appear above any NPC. However, the lightest hue (that is, white when you're editing the monochrome tileset graphic) will be transparent. That's how tall grass works: you see only the parts of the player sprite that overlap "white" pixels (actually light green, using the standard outdoor color palette.) You'll notice in the Magnet Train example above, I designed the overhead tracks to use only the three darker hues. There's one property of bridges I haven't discussed here: how is it possible to walk on top of them as well as below them? I'm not writing up a complete guide to that right now, but the short answer is "have pairs of identical bridge tiles with normal colors and PRIORITY colors, use them to assemble identical-looking metatiles, give the overhead metatiles collision data based on whatever's supposed to be underneath them, and use xy_triggers with changeblock commands followed by a refreshscreen command to swap in the appropriate blocks (this will lag a bit when you step on them)." Here's a video of the end result (apologies for the low quality).